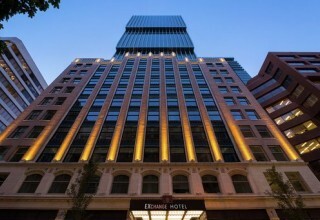 VANCOUVER, British Columbia, December 6, 2018	(Newswire.com) - The brand-new EXchange Hotel Vancouver (http://www.exchangehotelvan.com) is more than just a west coast outpost of the type of fusion architecture you see commonplace in London or Paris where heritage facades intersect with steel and glass towers. Although when Swiss-based Harry Gugger Architecture (responsible for the famous Birds Nest Stadium of the 2008 Beijing Olympics) designed the 32-storey pin-stripe curtain wall of the Exchange Tower, he obviously relished protecting the gorgeously decorated 11 storey stone arched structure originally inhabiting the site. The result is the 202-room EXchange Hotel that opened this month, which has a Vancouver vibe all its own. With a glamorous rooftop seasonal bar (still getting its finishing touches), and a swank 1920s art deco-inspired atmosphere, the unique classic contemporary design here is a worth a trip to Vancouver on its own. Originally built as headquarters for The Vancouver Stock Exchange in 1929 and now redesigned as a modern 32-storey architectural masterpiece, the EXchange Hotel’s Italianate lobby ceiling has been fully restored, along with the rest of the original marble clad Howe Street lobby. But after checking in to this glamorously designed space, don’t miss wandering into the adjacent newly constructed atrium lobby. Stretching sixty feet high, it offers glimpses of the modern building technology employed to allow the entire Exchange Tower to achieve the highest achievable LEED Platinum environmental rating. This awe-inspiring space says as much about Vancouver’s current heyday as a culinary, cultural and tech capital as it does about days of yore. One glance around the EXchange says it all: These are exciting times in Vancouver. The check-in experience does not end in the heritage lobby, but rather starts at the private second-floor reception to which all hotel guests are escorted by a hovering check-in concierge. Entering into this elegant “living room” style salon, one cannot help notice the stunning custom designed Ann Saks marble floor inlay complimented with sparkling crystal and brass Moorish designed Il Pezzo wall sconces amid original art pieces. 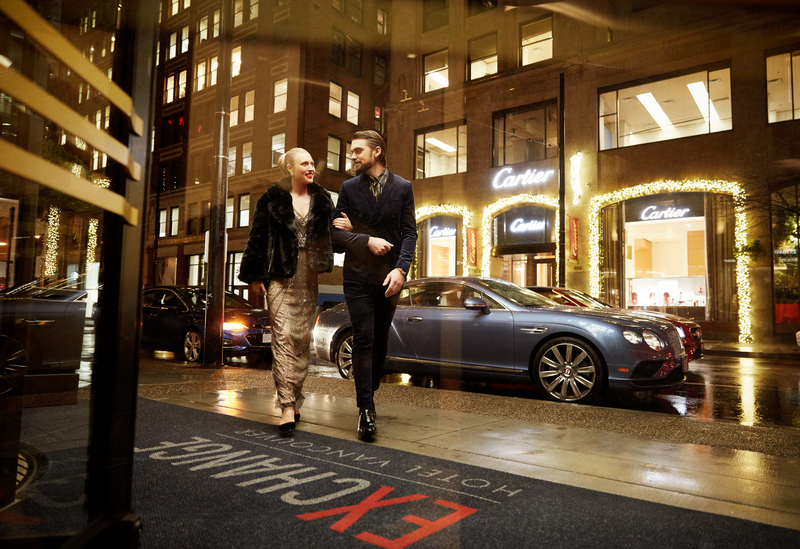 Guests enjoy complimentary local wines, spirits and culinary treats nightly (part of the hotel’s opening celebrations) in the Salon while overlooking Cartier Jewelry’s Vancouver flagship boutique from their second-floor perch. 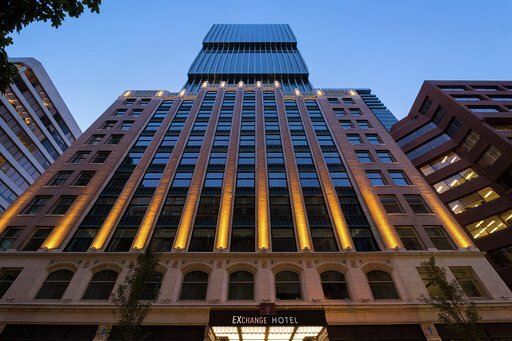 The EXchange Hotel, located in the heart of the city’s shopping and financial district, has its privileges. Upon checking in and making your way up one of three high speed “destination” elevators, a stylish surprise awaits once you exit into wide expansive hallways and make your way to your room. Although each room or suite in the EXchange offers up customized luxury with curated custom wall art murals, inlaid herringbone designed hardwood floors and all marble bathrooms (with heated floors for those whose toes may object), getting much of the buzz is the exclusive Dividend Floor upon which some of the hotel’s most glamorous suites exist. The Patio Suite overlooks an enclosed private rooftop court with illuminated greenery walls visible through 40 linear feet of window wall. The separated living room naughtily resides beside a smoked glass panel behind which an elegant antiqued bathtub sits on an elevated marble display. The hotel boasts this “marble wet room” feature in all four corner suites on the Dividend Floor betraying a slightly playful side to the hotel’s interior design. Rounding out the EXchange experience is the yet-to-open stylish Hydra Estiatorio Mediterranean (http://hydravancouver.com), a stylish bar and restaurant experience named after the coveted island in Greece. Expected to open in the New Year under Chef Mark Greenfield’s culinary direction (Black and Blue, Coast Vancouver), the hotel has this 110-seat restaurant on the mezzanine of the atrium lobby in its final stages which will feature modern classics from the Cyclades isles of Greece in a seaside inspired setting. Designed with rich hardwood floors and fashionable sheer drapes (think legendary beachside restaurants in Mykonos), Hydra will offer Mediterranean favorites like grilled sea bass with roast lemon and sea salt dressed tableside or carved spit roasted oregano lamb all drizzled with fresh olive oil from the cask and paired with luscious wines. Chic options like a seafood platter piled with Dungeness crab, scallops and fresh Carabineros shrimp with a shot of sherry offered up late night in the “Cabana” private dining room may require a well-deserved late check-out. Wake up late and visit Hydra Café, the mirrored coffee bar on the heritage lobby level, modeled after The Philosophers Library in Greece for those who enjoy their espressos or craft cocktails under sustainable local woodcraft shelves with wood slab books created by a local artisan millworker. EXchange Hotel Vancouver (http://www.exchangehotelvan.com) is located at the corner of Pender and Howe Street in downtown Vancouver, BC , within walking distance of the Vancouver Convention Center and waterfront cruise ship terminals, the Gastown District, Fashion District, Financial District, Vancouver Art Gallery, Rogers Arena, and Stanley Park. The company behind it all is Executive Group (https://www.executivehotels.net), whose seventeen properties worldwide include Executive Hotel Le Soleil Vancouver, Executive Hotel Le Soleil New York, Executive Hotel Cosmopolitan Toronto, Executive Hotel Vintage Court San Francisco, and Executive - The Inn at Whistler Village. Executive has also established itself as a diversified real estate construction, development, and management company (http://www.executivegroupdevelopment.com/home) known for developing quality projects and homes that stand the test of time in North America.